As was posted by the studio on February 06,2015, gamers will need to download the patch before entering online matches. Big day one patches are very common these days as both developers and publishers, commit to a date and are held to it, therefore instead of delaying the game, they make some final tweaks even after the game has gone gold. This is not a bad thing and given that there are so many different factors for a game’s release date, developers often don’t have a choice but to do this. Early reviews of the game appear to be quite favorable and the update is said to improve some aspects like loading times and eliminate several bugs found during Beta testing. That could make the game an even smoother experience. 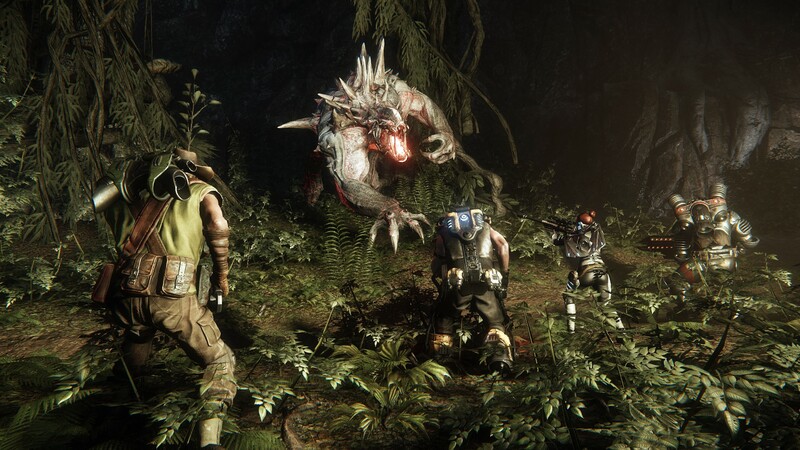 Evolve is an asymmetrical multiplayer game pitting four player-controlled Hunters against an alien Monster, controlled by a fifth player. Both Hunters and Monsters can use unique abilities during the game. The Monster player can kill other smaller creatures to evolve and become stronger by entering a cocoon stage, leaving itself vulnerable for a short duration. Hunt: The Hunters must kill the Monster before it can destroy the power relay located in the map. The Monster must reach stage 3 in order to destroy the relay, though it can also opt to kill all of the Hunters. Nest: Six Monster eggs are located in random locations on the map. The Monster must protect them from the Hunters for 10 minutes, and can hatch one of the eggs to spawn a minion to help it. The Hunters must destroy all six eggs, as well as any minions, within the time limit to win. Rescue: Injured colonists trying to escape the Monsters are placed randomly on the map. Hunters need to locate, revive and protect them as they make their escape. The monster needs to kill as many of these colonists as possible and keep them from getting away. Whoever saves—or kills—five colonists first wins. Defend: A starship’s refueling station comes under the assault of a player-controlled fully evolved monster and smaller Goliath minions. The hunters must stop the monster from causing a catastrophic accident by protecting the power generators until the ship is fully powered, while the monster must destroy two generators to reach the ship’s power source. 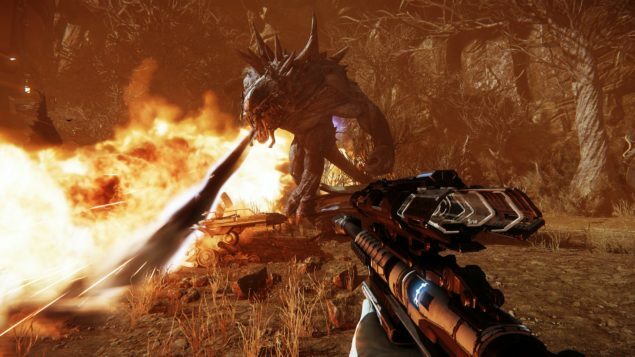 Evolve provides two different structures to these game modes: Quick Play, which enables single matches; and Evacuation, which serves as a five-match multiplayer story mode. In Evacuation, each subsequent match gives the winning side an advantage in the next map (such as a destroyed power plant releasing toxic gas the monster is immune to or a saved one powering autonomous turrets to assist the hunters), ending with a Defend match. Evolve is set on Shear, a distant planet located in the “Far Arm” of space, that humanity has traveled to in the distant future. The established colonies, considered the most valuable in this region of space, are soon attacked by malevolent alien Monsters.As the Monsters destroy the colonies on Shear, a former planet tamer named William Cabot is brought out of retirement to deal with the threat, in order to evacuate the remaining colonists from Shear. In response, Cabot assembles a team of Hunters—consisting of war veterans, psychopaths, professionals and expendables—to eliminate the Monsters, setting the main conflict of Evolve. 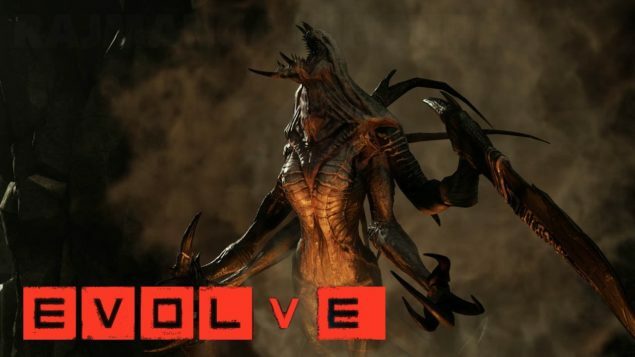 “What can you really add to Evolve at this point? It’s already gone gold!” This question came up a lot over the course of the Open Beta weekend in January. Truth is, that long weekend was a big learning experience for us. As a result, on day one – before you even start your first match on the live servers – we’ve made a number of refinements through a day-one patch. We already noted this in an interview with Turtle Rock’s Chris Ashton, but we are constantly adjusting things in the background so that every Hunter and every Monster is finely tuned. What we learned about what’s being done to Wraith alone was eye-opening. ( Check out the Open Beta infographic and Q&A here.) A lot of the data gathered from the Big Alpha and Open Beta weekends helped us make these tweaks. As we strive to push the engine and cram as much as possible into your Evolve experience, we’re also working are to optimize performance on your system. These improvements range from load times to improving matchmaking and network bandwidth optimizations. After the Big Alpha, we wanted to rework the Elite skins for Hunters and Monsters based on feedback we got from the community. The results of those requests are right here in this patch. We’ve updated or outright replaced the assets that were already in the game. All you need to do to unlock them: EARN THEM. Learn more here. This patch adds connectivity to work with Evolve Hunters Quest. We recently unveiled the game / companion app for Evolve. In one respect, it’s a fun Match-3 puzzle combat game. But it also has ties into the main console game through the my2K servers. Earn experience and watch overhead match replays through the app. Best of all, it’s free for iOS, Android and Windows Phone. Learn more here. Like we said up top, this update comes from lessons learned in the Big Alpha and Open Beta. We aren’t stopping here. As we make improvements to the game – and we will – keep your eyes posted for updates like this on the Evolve News Blog. Need additional details on updates coming to Evolve? Head to support.2k.com. Thanks for helping us – and joining the hunt! The Evolve team at Turtle Rock Studios and 2K. It’s nice to see Evolve turn out this good and the talented team at Turtle Rock Studios being praised for their work. I am eagerly looking forward to playing the game and hope that the team keeps improving the experience even further.